What is a clean method of running cables from one side of a wall to the other side, in a typical residential house? On one side of the wall will be a computer tower, and on the other side will the the user interface devices (monitor, keyboard, mouse, speakers, etc). Cables will be rarely added or removed, so it doesn't need to be convenient but must be possible. There is a quick and easy way to do this, no special tools, $10 of parts, 20 minutes work if all goes well. and optionally a studfinder to make sure you pick a clear hollow spot. 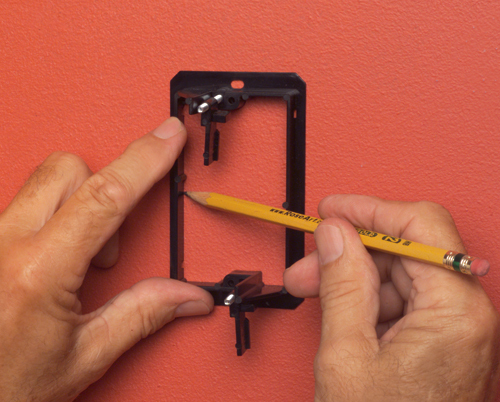 When you pick your spot, try to match the height of any nearby electrical receptacles. Try to stay well away from studs. You can use a studfinder, or look for the nails holding the base molding to the wall - those will be nailed into the studs. You can also turn off the breaker for a receptacle and take the cover plate off, you'll probably see the box is nailed to a stud, and you can go on the other side of that stud. When you cut the hole for the bracket, make a horizontal cut first so you can adjust if you miscalculate and hit a stud. Don't plunge the saw in - take your time, use just a couple inches of the blade, just in case there's something behind there you don't want to hit. edit After you cut in the first bracket, move any insulation and poke the drywall saw through to the other side, just enough to pierce the drywall so you can place the bracket on the other side of the wall. If you stop using the pass-through some time in the future, you can just remove the duckbills and put blank covers on. I am confused about what "one side of a wall to the other side" means. Does it mean through the wall (from one room to the other) or from the left side of the wall to the right side of the wall in the same room? The answer from batsplatsterson is great if running a wire through a wall (or even up a wall from a low point to a higher point). But it will not work if running a wire from left to right on a wall - there will be studs in the way. Not the answer you're looking for? Browse other questions tagged walls cable-management or ask your own question. How do I soundproof my vaulted townhouse wall? How can I install a frost-free outdoor faucet with very little space? Is there a way to cover a hole for cables that does not require a wall box? What is the best way to mount a tankless water heater to a concrete wall?